Paramount Pictures started rolling out new posters for The Spongebob Movie: Sponge Out of Water yesterday, unveiling new looks for Plankton (Mr. Lawrence) and Mr. Krabs (Clancy Brown). 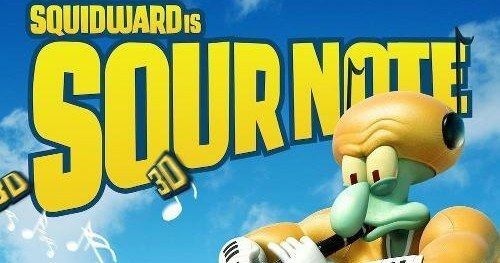 Today, the studio has unveiled the latest character poster, showcasing Squidward's (Rodger Bumpass) new massive alter-ego "Sour Note." As you can see in the one-sheet, this isn't the same Squidward fans are used to on the SpongeBob SquarePants TV series. The story follows Spongebob (Tom Kenny) and his friends leaving Bikini Bottom, entering our world for the first time. The encounter a nefarious pirate known as Burger-Beard (Antonio Banderas). This evil character is searching for the final page of a mysterious book. We saw in the first two trailers that Spongebob and his Bikini Bottom crew all "transform" into much larger versions of themselves, as you can see in this poster for Squidward, who dwarfs the massive Mount Rushmore. Paul Tibbitt (The SpongeBob SquarePants Movie) directs this new adventure from a script by Jonathan Aibel and Glenn Berger (Kung Fu Panda). The supporting voice cast is rounded out by Thomas F. Wilson, Bill Fagerbakke and Carolyn Lawrence. Check out the latest one-sheet, then check back tomorrow for the final character posters.